After Doctors refused to give his son Sol a prosthetic arm before he turned one, Ben Ryan from Bangor sought his own solution to ensure his little boy could lead a normal life. Due to an injury inflicted at birth, 10-day old Sol had to have his arm amputated leaving him with the prospect of being unable to crawl and play at an early age. Since then his father developed a revolutionary bionic arm using sheer will power and standard, at-home equipment- including an Xbox 360. Mr Ryan began working on a solution for his son shortly after he was told by Doctors that there was nothing they could do until he was at least a year old, and even then Sol would need to be three before he could be fitted with a movable electric device. Knowing he could do better than sit and wait to see if his son would accept a prosthetic, Ryan decided to take action, initially starting the journey when his son was five weeks old. He began by using objects from around the house, such as a piece of sponge alongside a bandage as a prop, in order to extend Sol’s arm and help him to play. The devoted father then looked into much more inventive solutions, developing his initial vision into a revolutionary design. Inspired by the way spiders move their legs, Ryan designed the arm using fluid pressure (hydraulic) to operate a grabbing mechanism. This means that it does not require batteries, contains no small parts and is extremely lightweight, thus allowing the wearer to control a basic grabbing mechanism earlier than ever before. 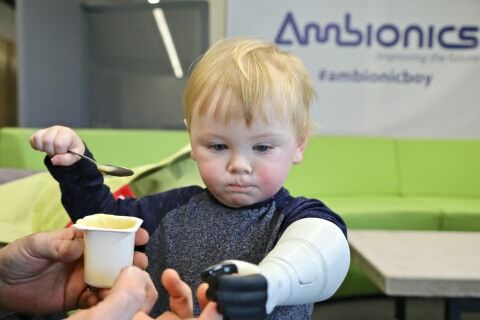 Ryan’s aim is to encourage the arm’s use from an early age as a kind of training device for young amputees, which will thereby allow them to better adapt to more advanced prosthetics when they reach 3 or 4 years of age. Choosing to 3D print the arm using the local university’s 3D printing system, Sol’s arm was scanned allowing the prosthetic to be customised to fit perfectly. Additionally, the advanced 3D printing technology that has been applied throughout the development of the arm means that it can be made cheaper and faster than any other prosthetic on the market, giving thousands of children the chance to have a prosthetic fitted in the crucial time frame between one and two years of age when they are able to easily adapt and best able to accept a foreign object. Using only limited knowledge and pure determination, Ryan’s self-taught design software skills were put to the test using Autodesk Fusion 360, a laptop, an Xbox 360 Kinect scanner and his local university’s 3D printers- eventually developing this unique technology. Now, with the help and expertise of world-leading Stratasys 3D printing technology, Ryan will be able to fine tune the design professionally and his dream of helping other children with upper limb differences can be made a reality. ‘Stratasys are very excited by what Ambionics is achieving and they have been incredibly helpful since we first asked for assistance with the project in December,’ said Mr Ryan. A firm believer in prototyping as a form of research, the former psychology lecturer is now looking to raise £150,000 to patent the technology, as well as have it medically tested and certified so that it is accessible to other youngsters in a similar position to Sol.